FAQ: What tank options are available for diesel fuel storage? Question: I am looking for flexible fuel storage tanks. What do you have available? I need something that is around 50,000 gallons in storage capacity and I need it to be able to handle the storage of diesel fuel. Do you have anything available for this purpose? What kind of size I am looking at for a fuel storage tank in that ccapacity? Thank you for contacting us! We do offer Flexible Fuel Storage Tanks that can be used for the storage of diesel fuel in the capacity that you have requested. These tanks are made from a high strength urethane material and have been used to store diesel, Jet A and some types of hydrocarbons. Tanks are designed in capacities from 25 to 210,000 gallons for diesel fuel storage. You can use a single tank, or daisy-chain them together ina fuel farm. They provide a low profile storage option which can be deployed with ease. Our flexible fuel tanks ship folded up in a low pack volume so shipping is much more affordable as well. Again, if you are planning on storing this is a specific or space-restricted location, please let us know and we will work to see if we can build a tank to meet these requirements. For additional information, review our Pillow Tank page. 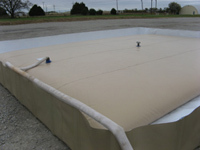 Secondary Containment Liner/Ground Cloth: A common choice for containment underneath these tanks is a secondary containment ground cloth. These liners are designed to fit neatly under the tank to provide abrasion protection and containment. Liners may also be used as part of an embankment plan to contain materials. Secondary Containment Berms: Another option for secondary containment is one of our spill berms. These berms feature a containment liner with built-in walls to secure your liquid materials. This helps to contain liquids in the event of a spill. Questions? We can help! Call our team at +1-772-646-0597 or request a quote to discuss your project.